Powersail Training is a Royal Yachting Association (RYA) recognised Training Centre and Yacht Charter business and provider of sailing corporate events. Our base is Dartmouth on the beautiful South Devon coast during the warm summer months and Portsmouth in the sheltered waters of the Solent from October to March. We are a small, established, Dartmouth & Solent Sea School dedicated to providing quality Sail Training and Skippered Charters with maximum fun and safety; all delivered by a professional RYA Yachtmaster Instructor and Examiner with 20 years teaching experience. 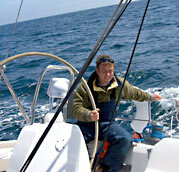 Copyright © 2007.Powersail Training Limited.All Rights Reserved.